You know how every time battle starts, the music changes? Even if the monster you’re fighting is just a baby crab? Yeah. I’m mostly talking about Oblivion, but that happens in most games. 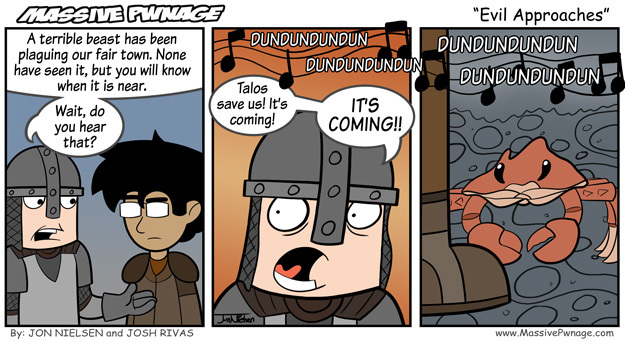 Apparently, Locke started playing Oblivion again, and that’s where the idea for this comic came from. It’s funny when you’re just running somewhere, and then this epic battle music starts all of a sudden. And then you turn around to find a little rat or crab. This entry was posted on Friday, July 18th, 2008 at 12:00 am and is filed under Comics. You can follow any responses to this entry through the RSS 2.0 feed. Both comments and pings are currently closed. Yeah that’s the best way of knowing when enemies are near by, and if you miss the music and the enemy catches up to you, your heart skips a beat when you hear the “BAM!” of something smacking you. Shivering Isles does away with this concept,by making EVERY monster FRIGGIN AWESOME! That was a really good expansion. I liked the Knights one a lot too.